I have to say that spaghetti is one of my top 5 things to eat. I LOVE spaghetts. Usually, I like a good meat sauce with my spaghetti. But sometimes I feel like a meatball. 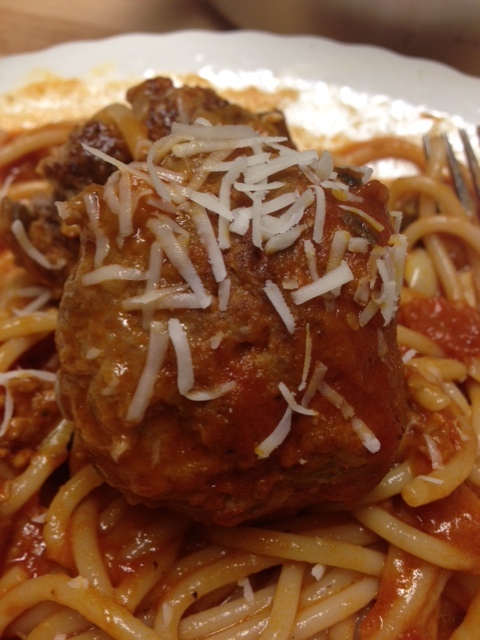 If I make meatballs with my pasta, then I know I will have leftovers for a messy meatball sandwich! 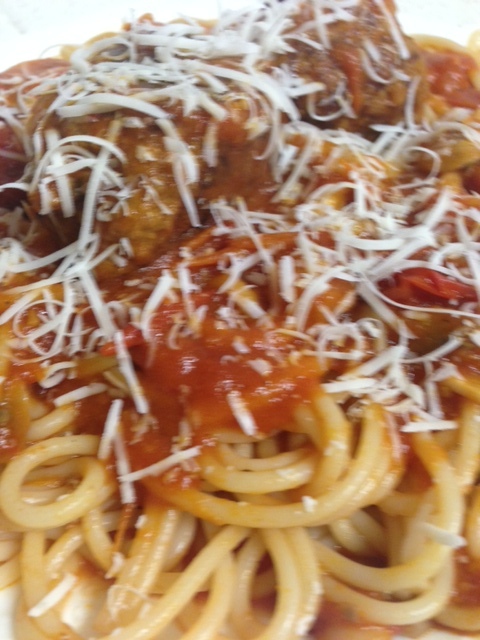 Don’t you think there is something very comforting about a plate of spaghetti with a meatball sitting on top? Sprinkle a little cheese…ahhhh.. YUM. 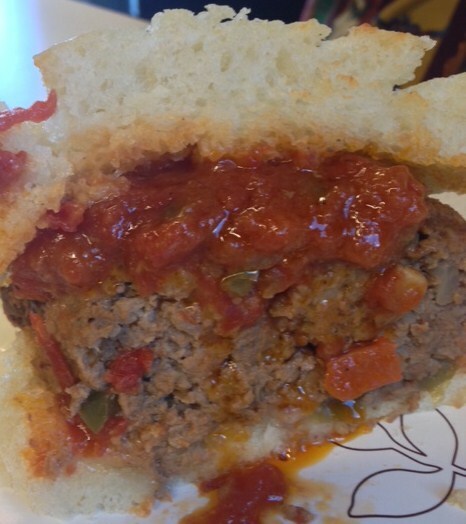 But a good meatball sandwich on a good crusty Italian roll, smothered with cheese….all oozy goozy, messiness…sauce dripping down your arm and all over your face. Not that it would ever happen to me! I would eat mine very ladylike, with a fork and knife….little pinky sticking out. Well, ok…I lied. I prefer the messy version. Just so good and fun to eat. I like a meatball sandwich on my homemade Focaccia bread. 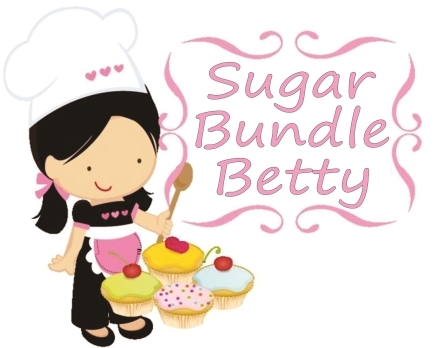 You can find that recipe in my Recipe index. 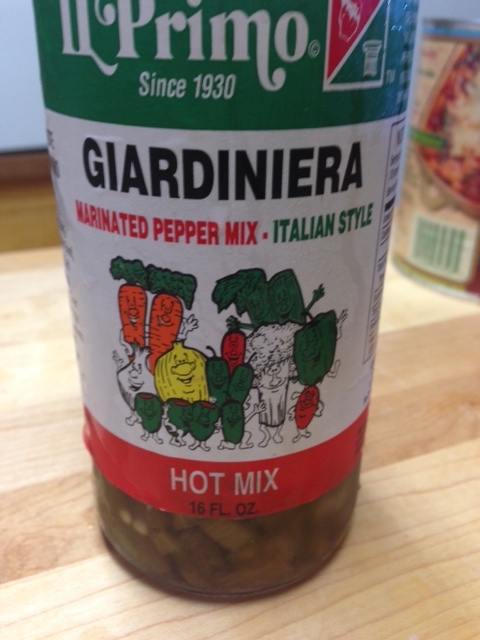 Oh, sometimes I make my meatballs with Giardiniera marinated peppers. Some of your grocery stores carry them but Italian markets have them for sure. They are great on a sandwich, on fish, salads and of course meatballs. I like the extra hot ones. Use your favorite pasta sauce…everyone has one! If you don’t, there is one posted in my recipe index under Baked Spaghetti. So, go make some meatballs! Put your bread slices in a large bowl…pour enough milk to make the bread all mushy. Add the rest of the ingredients. Form your mixture into balls. In a large skillet, brown your balls….turning them to get them all evenly browned. Add them carefully into your simmering sauce. Simmer until the meatballs are cooked through. Pile em on top of your spaghetti or make a sandwich! Enjoy……get messy! I am so going to give this a try this week! I’ll let you know how my meat balls turn out! but I will have to skip the veal… i don’t think i like veal! Jem, I rarely use veal. usually its just the ground beef. enjoy!! !